Torrents are extremely popular ways of sharing and downloading files, especially big size files over the Internet. It is really annoying if your torrent downloads slowly and takes hours or even days to finish. Then how to speed up torrent downloads? Well, the slow internet speed and less number of seeders can be the basic reasons for slow torrent downloads. And there are many other factors may result in slow torrent downloading. If you know and understand all aspects of torrent downloading, you’ll be able to maximize torrent download speed. In this article, we’re going to see quick tips on how to increase torrent download speed. Check them to make your torrent download faster. There is an abundance of torrent clients out there but unfortunately, not all are equal in quality. To maximize the torrent download speed, we suggest you choose a lightweight torrent client, which only focuses on downloading torrents and speeds up the transfer rate. BitTorrent is one of the most popular torrent clients out there, but it comes with bloated apps and can be heavy on system resources. While µTorrent and qBittorrent are lightweight torrent clients you can rely on. This should go without saying but because technology is rapidly progressing nearly every day, it’s important that you have the latest software version. Your torrent client is not an exception to this rule. Features like peer exchange with tracker-less control and DHT have only been recently integrated into most clients. So make sure you’re running the latest version of your preferred torrent client to benefit from any new rules or protocols. There are three key concepts that determine what a healthy torrent is and what isn’t. Seeder, Leecher and Peer. These terms and concepts make torrent sound a bit like farming but let’s define them quickly. Leechers: The downloaders. Refers to those who doesn’t have the files but has joined the network to download them. Peers: Those who are both downloading and uploading. Basically active users in the swarm. A seeder and a leecher combined. Torrent clients introduced this type of peer to peer sharing so downloaders wouldn’t have to wait for seeders before they could start downloading pieces of a file. Usually, the number of seeders should be higher than the number of leechers (and/or peers) for a high torrent download speed. The greater the number of seeders you have, the faster a torrent can download. When you’re picking a torrent, ensure that the seeder ratio is high. 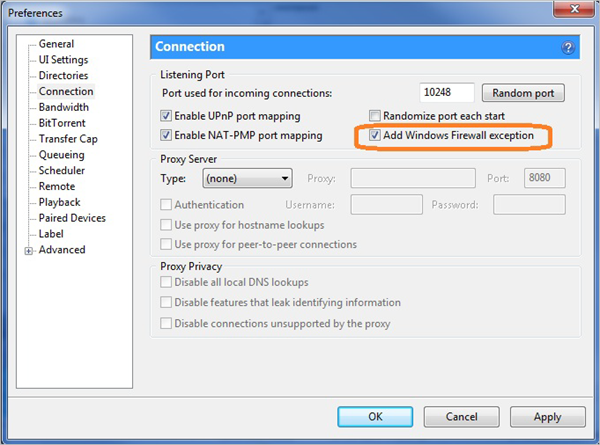 Windows firewall can block your torrent client from listening to any ports. To prevent or fix this, all you need to do is add an exception to your Windows firewall. All you need to do is go to Tools > Options > Connection and check the Add Windows Firewall exception box. Choking occurs when you are a peer and your upload rate becomes so great that it overpowers your rate of download. To prevent this from occurring you can limit the upload rate for each torrent individually or you can change their global settings. To limit the upload rate for a specific torrent, right-click on it and open its properties. From the properties screen, choose the Advanced Tab. You should find the upload rate at the bottom of the screen. Note that setting the upload rate too low will also stifle the download rates. So you should set it to around 60-80% of your maximum download speeds. You can leave the download rates as they are (maximum). To limit global upload rates for all torrents, go to Tool > Options > Connections. Once again, near the bottom of the screen, you should find the option to modify the maximum and minimum upload rate. This will modify the speed for torrent tasks. You can also change the maximum upload speed for all torrents tasks under the connection properties. Another way of ensuring that your torrent download speeds are as efficient as possible is changing the number of connections so that there are no overloads. You’ll have to employ a bit of trial and error here. The most efficient number of connections is dependent on the speed of your computer and internet connection. What we can do is recommend a rough rate. To access the connection options, go to Tools > Options > Advanced. From here, look for an option that reads “network.max_connections”. Once you’ve found it, change its value to 100. Sometimes, the best way to improve the speed of your torrent downloads is to add more trackers. What is a tracker? Trackers are servers that control the communication between peers, leechers and seeders. Increasing the number of trackers and using more efficient ones can help you find more seeds for the torrent. In order to add trackers to a torrent, right-click on the torrent in question and navigate to the Advanced tab where you’ll find the Tracker List. You can then append or add any new trackers to the text field. These are some of tips which can help you speed up torrent downloads. Hope you will find these tips helpful. If you know any other tips on how to increase torrent download speed, please do not hesitate to comment and share.